Full of contemporary style, the 4-star superior Park Hotel Amsterdam sits beside the canal and close to the Rijksmuseum. Relax in the hotel’s lobby where you can curl up on an oversized sofa, take in an art exhibition or enjoy a drink from The Jewelry Bar, while the MOMO Restaurant and Bar is one of the city's trendiest nightspots. Featuring unique open-plan design, rooms have flat-screen TVs, and high-speed wifi, and are decorated with George Heidweiler artworks. MOMO Restaurant, Bar & Lounge is the new hot spot in Amsterdam and blends the flavours and colours of the Far East with the style and sophistication of the West. The MOMO experience stands for quality and service in a unique setting and can be enjoyed at any time of the day! Besides being the place to be for an exquisite lunch and dinner, you can also visit MOMO for a delicious cocktail in a setting of international grandeur. Next to leafy Vondelpark, this canal-side 4-star superior hotel sits in the stylish Oud Zuid district. Amsterdam’s best museums are on the doorstep, while several public transport links provide easy access to the rest of the city. Hotel highlights include a bar, gym, free wifi and an award-winning restaurant. The modern rooms are elegantly decorated and have an open plan bathroom. With over 100 years of history, this 4-star hotel, in the heart of Amsterdam, is a unique part of the city's past. The hotel faces onto a picturesque square complete with water-fountain. Dine in the hotel's famous café, which serves food throughout the day in an Art Deco setting and on Saturday's also offers afternoon tea. If the weather’s fine why not eat out on the terrace? If not, relax in the on-site sauna. Rooms have air conditioning, wi-fi, tea and coffee making facilities and a minibar. Sitting on the bustling Leidseplein, neighbouring the famous Vondelpark, the 4-star American Hotel Amsterdam dates back to 1902, and is famous for its Art Deco style. Café Americain’s sophisticated menu and high teas have made it a popular haunt of locals and artists and many celebrities have ordered a cocktail in the elegant Bar Americain over the years. The Amsterdam American Hotel's rooms have flat-screen satellite TVs, free wifi and private bathrooms. A 4 minute walk from the fashionable P.C. 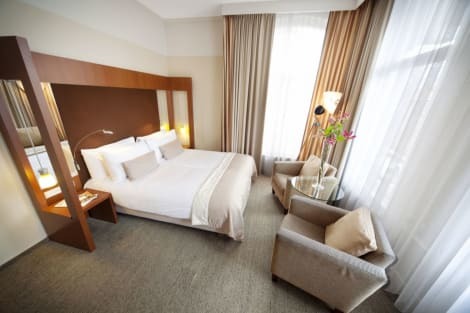 Hooftstraat shopping district, this modern 4-star hotel sits close to Leidse Square. Hotel highlights include a spa with hammam and sauna, a gym, onsite bar and restaurant and free wifi to keep you connected. The rooms have a warm interior design and hardwood flooring and are air-conditioned. With a stay at NH Amsterdam Centre, you'll be centrally located in Amsterdam, within a 10-minute walk of Rijksmuseum and Van Gogh Museum. This 4-star hotel is 0.6 mi (1 km) from Heineken Experience and 1.1 mi (1.7 km) from The 9 Streets. 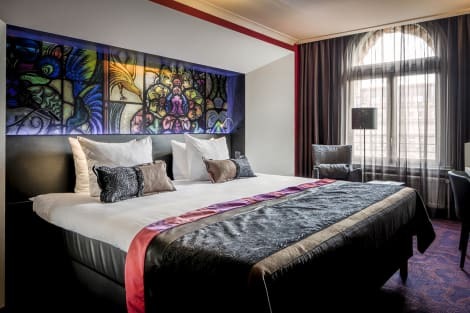 Combining contemporary style with period architecture, the 4-star Bilderberg Hotel Jan Luyken is housed within several former 19th century mansions, and sits in the exclusive Oud-Zuid area of the city, close to the Van Gogh Museum. The Bilderberg Hotel Jan Luyken has a spa bath and hammam in its elegant wellness room, the WB bar is a trendy place to enjoy a drink and the property offers free Wi-Fi. The hotel’s rooms have LCD TVs, and strikingly designed bathrooms with rain showers and the Superior rooms propose the Nespresso coffee-machine.